Cowhorse Equipment offers several styles of cavessons in small, medium, large, and extra large sizes. They are offered in Hermann Oak harness leather, hand lay nylon rope, and small doubled nylon rope with rawhide buttons. 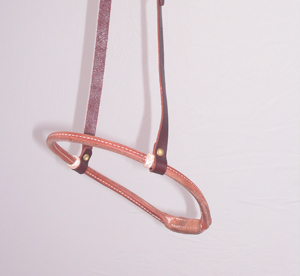 The doubled nylon rope cavessons are adjustable, all the rest are adjusted from the headstall.